We Love It, Don't We? Beehive bodies. What did you think I was talking about? It's that time of year when a young man's fancy turns to molten wax and gum rosin. So! What this entails is bringing like a hundred plus pounds of wax, paraffin in this case, mixed with gum rosin to a simmer in your homemade propane fired dipping setup. (Rooster is optional.) Maintaining a temperature high enough to get the job done but below the flash point of both the ingredients, you submerge a box and let it cook for 12 minutes. And viola! Ya, they look pretty much exactly the same afterward, but the water, it beads off like magic! And such a fresh piney turpentiney scent while they cook. A two-headed Babymomster. It even warmed up enough for the bees to come out for a cleansing flight. Bee poop everywhere! The new uncapping machine. We'll get to see it in action sometime in July, I reckon. I took a photo because it will never look this shiny again. Some wax blocks after coming out of the (also new, but no longer shiny) wax melting/cleaning tank. It went through multiple "washings" which filled the cellar with a lovely warm honey toasty waxy scent. And a visit to Lily's 3rd grade Valentine's Day party. Daddy didn't make it back from work in time to babysit so Leo came along and played Cupid. 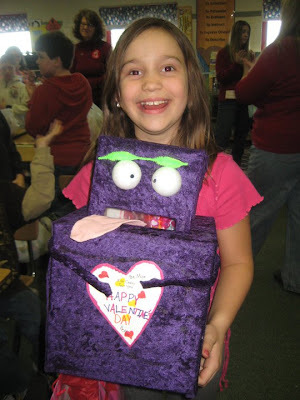 And Lily won 1st place for best Valentine box. (I got 1st place for only one hot glue gun blister from its construction. But then I had to relinquish my title since I cussed when it happened.) Finally, no photo, but imagine a beautiful vase of roses from Mark delivered to me this morning for Valentine's Day. Even though I almost didn't answer the door for the flower guy. Didn't he know I was doing the old Race For A Shower While The Baby's Sleeping thing? Happy Valentine's Day to all and to all a good night. Making the bee boxes with the paraffin wax is interesting and all, but what's really great are the photos of the baby. Keep 'em coming. I love the ones in your previous post, too, with The Guy standing on Dad's hand. Sara, I'm so glad to see you're back in cyberspace. I'll have to start checking in here again, since I kinda got out of the habit. The sun is shining. When are we going riding??? We need to build a papoose for Leo to come along with us. To be honest, I'd be happy right now just going out into the mud and getting my fingernails all grungy scratching horse itches. I'm desperate!!! Hey, it's cool to see how it's really done! Wow you got roses? they only time I got them was when I had a baby. 2times that's all, he was done! It was 70 degrees here yesterday, zero the same time last week. Crazy! "What the hecks?" It's Suburban Matron.